SL Khan comes up with another useful tutorial for construction professionals that will teach you how to work out materials for floors having area of 30 sq.m. 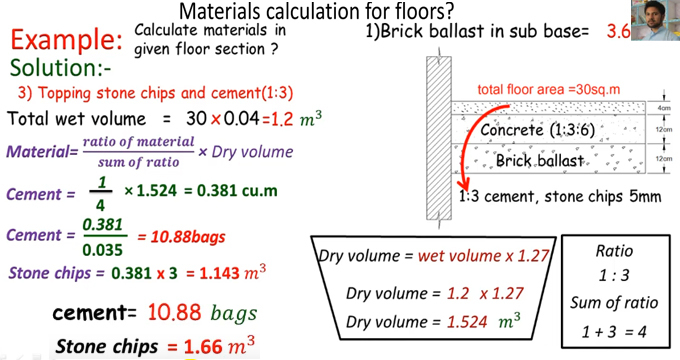 Here, in this video, the floor contains sub base as brick ballast with 12 cm thickness, based is created with concrete mix in the ratio of 1:3:6 with thickness 12 cm and the topping is made with stone chips (5 mm) and cement in the ratio of 1:3 and with thickness is 4 cm. This tutorial is specifically recorded for quantity surveyors. The materials selected for floor covering, are dependent on the various factors like cost, endurance, noise insulation, comfort and cleaning effort. Certain types of flooring should not be set up below grade, along with laminate and hardwood because of probable destruction from moisture. The floor located underneath the flooring is known as the subfloor. It gives the support toward the flooring. There are special purpose subfloors like floating floors, raised floors or sprung floors which are arrange on another underlying subfloor to make the structure stronger. Subfloors which are located underneath grade (underground) or ground level floors in buildings devoid of any basements generally contain a cement subfloor. Subfloors above grade (over ground) generally contain a plywood subfloor.